Mike Rieser got the fly fishing bug at the impressionable age of ten. A keen interest in fly tying quickly followed with raids on his mother's sewing kit and the gathering of feathers and fur from reluctant barnyard critters. A driver’s license and a car in 1967 carried Mike's fly fishing passion from the local rivers and ponds to the Pacific Ocean in pursuit of bonito, calico bass, strippers and blue shark. Mike Reiser shares his newly discovered fly fishing techniques in hooking and landing roosterfish in the surf. Consider this the advance course in stalking roosterfish that you won't find anywhere else. Mike Rieser, a well know guide in Mexico, takes us on a tour of Magdelena Bay in Baja and its hundreds of miles of mangrove channels, pristine beaches and fabled Thetis Banks. Snook, corvina, spotted bass, cabrilla, golden trevally, grouper, pargo, bonefish, roosterfish, yellow tail, skip jack, dorado, yellowfin tuna, wahoo, billfish and more all await your cast. Join use to find out about the best way to take part in this exciting and remote fishery. In 1973 Mike made his first trip down the Baja where he would spend the next 15 winters camping on the beaches and fishing flies in this new fly fishing frontier. A great deal of time was spent camping and fishing with the hand line fishermen (Pangeros) who despite their skepticism about fishing the wimpy rod, shared their knowledge of the Sea of Cortez and its great variety of fish. Through trial and error, the methods evolved to catch many species, such as roosterfish once deemed impossible on the fly. This foundation of knowledge and experience would eventually lead to the foundation of The Baja Flyfishing Co. in 1997. Always innovative, Mike has developed tactic and fly patterns effective on a wide variety of species that swim the Sea of Cortez. 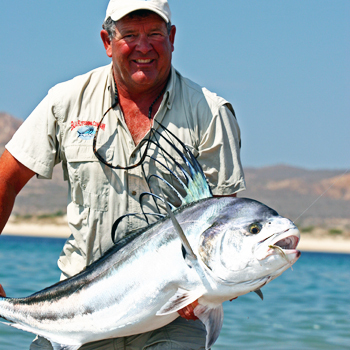 Mike and the other guides at Baja Flyfishing spend considerable time in the pursuit of roosterfish with many large specimens landed by Baja Fly Fishing clients each year. Besides guiding on the Baja, Mike has worked as a fly fishing guide since 1974 in the Sierra Nevadas and the Rocky Mountains. He ties flies commercially and worked as a saltwater fly fishing adviser for the Fly Fishing Destinations television show. The Baja Flyfishing Co. has been featured by Warren Miller Productions, The Ron and Raven Show, Fly Fishing Across America, Michael Fawlk's Productions, Seasons on the Fly and Anglers West. Mike has also written several magazine articles and published his book Fly Fishing Baja and Beyond. For more information on Mike's' guide service, trips and fishing reports visit his web site at www.bajaflyfish.com.